A Simple Kinda Life: Yo-Plait YoPlus - Review & Giveaway! We are HUGE yogurt eaters in my house! Matter of fact, we LOVE anything dairy! So when I was given the opportunity by My BlogSpark to try Yo-Plait YoPlus yogurt I jumped at the chance! Today, on behalf of My BlogSpark and Yo-Plait, I have up for offer not one, but 3 prize packs. The winners will receive what is in the photo below. About Yo-Plus: It works to naturally regulate your digestive system and keep you "regular". How does my system get out of balance? There are lots of factors that can have a negative effect on the friendly bacteria in your body. Disruptive things like a poor diet, stress and antibiotics can all take their toll. As the number of friendly bacteria decreases, there's more room for unfriendly bacteria to move in. And that's where Yoplait Yo-Plus yogurt can help. With just one cup of Yo-Plus yogurt you'll treat your body to our special blend of both probiotic cultures and fiber - to help your digestive system keep the balance nature intended. Enjoy Yo-Plus daily to feel the benefits. So what are the probiotics found in Yo-Plus? + Yo-Plus has a probiotic culture called. Bifidobacterium. This is a special type of live and active culture clinically shown to support digestive health. Probiotics, meaning literally "for life", are a good kind of natural bacteria. They give your system the friendly active cultures it likes to keep you in balance. 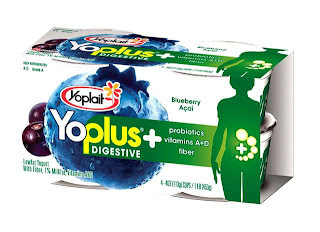 + Yo-Plus is a good source of fiber with 3 grams per serving. + Yo-Plus is a good source of calcium, vitamin A and vitamin D.
+ It has only 110 calories per serving. + And there's only 1.5 grams of fat per serving. Your body knows how to take care of itself. But now you can give it a little more help. Every day. There are so many flavors for this yogurt that it is amazing! While you're there, you can even print a coupon for $1 off of your next purchase. Share your tips on how to stay healthy and maintain a nutritional diet this year. That's a total of 11 entries if you do all of the above! Giveaway ends on 3/24 at midnight and winners will be notified soon thereafter. Thanks to My BlogSpark for this opportunity! Diet and exercise are where it's at! And I have my own healthy cookbook!! Come on over to my blog for my pearl earrings giveaway, ok? I am trying to stay away from processed foods. It's easier said than done for me with 2 teen boys, but we're doing it! I'll definitely have to try this yogurt soon. My biggest tip is just to stay active. I hit the gym at least 3 times a week (thank goodness for childcare at the gym). I also try to eat a lot of unprocessed food. Eat slowly so your brain has time to tell your stomach that you are full. And get all the exercise you can. :) Thanks for the giveaway!! i've been using the livestrong daily plate to keep track of my daily caloric intake. We eat lots of steamed vegetables. My kids eat lots of cheese and yogurt to get their calcium needs (since I can hardly get them to drink milk). Also we take walks as a family every night. It bonds us together and gets us exercise. For me it's all about counting... calories, calcium, sodium, fiber... daunting? yes, but effective! and the YoPlus is good - yummers! Hmmm...so are you telling me that my diet of energy drinks and M&Ms isn't exactly healthy living? Oh no! I guess I am in a world of hurt. Welcome to SITS! So glad that you joined our little community. I have to keep the junk food out of my house to stay healthy. I'm a GS Leader, so I bought a bunch of cookies and I had to put them in the freezer to keep from eating them all. So my healthy tip is to not buy it. If you don't buy it, you can't eat it. Lots of water, exercise, fresh fruit and veggies. I'm just passing by from SITS! I have stopped drinking soda all toether this year and I'm cutting out most of our convenience food instead making dinners from scratch! What a unique and fun give-away. How exciting!! I am a vegetarian so it is important to know how to feed my body the right foods to stay healthy. I just started p90x as a workout program....it is so hard, but so good. Welcome to SITS... I hope you enjoy it. Make sure to jump around and meet some new blog friends. I host a monthly card swap, check it out if you like "good mail". I started eating healthly. Fruits/veggies & 100 calorie snacks. I use the wiifit. It's awesome. Fun & exercise all in one. Just wanted to say hello and welcome to the SITS community! I am trying my best to get healthier by walking a couple of miles a day on my treadmill. Walking through our neighborhood on the pretty days. I also started hanging my clothes out on a line and this gives me extra workouts daily. Walking up and down the line, bending over and picking the clothes up and such. Also baking more food than anything else these days. I am following you on twitter. I already follow your blog. I tweeted about your giveaway Angela. I am very careful when I food shop, I avoid all the junk. I love the yo-plait. I have just gotten some and I really liked it. To stay on the good side I enjoy taking my little one and dog for a walk. I also eat good foods. I love summer when all of the great fruits come out. This year I've banned all cokes and sodas from our house. I'm also trying my best not to stop at fast food places. I keep granola bars in the car in case anyone gets really hugry. That helps with the temptation to drive through for fast food. 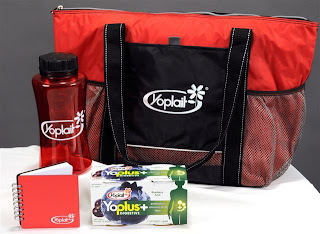 This looks like a great giveaway, that bag and bottle would be great for going to the gym. Hmm, my tip for getting healthy this year is to increase my exercise. I'm trying not to focus on my weight too much, I just want to be in good physical shape. If the payoff is losing a few lbs, then great, if not, no sweat. I've been trying to walk/jog at least 5 times a week and am incorporating more veggies into my diet. I think my biggest one is diet then probably excercise but diet is huge with everything. Sorry I didn't see that, I remember reading this but I didn't realize this was what you wanted us to write. :X I don't think I comprehend fully all the time. Healthy? Moi? Well, I try. The one big change I've made this year towards being healthier is to drink water. I cannot stand water and it actually makes me ill but I force myself. I drink gallons of milk but in the past, no water, ever. Water IS good for me, right? I keep reminding myself. I'm now an email subscriber ; I can't believe I wasn't before. It's not only for the entry that I do this, you've got a very cool blog with lots of interesting things! How I maintain a healthy diet I eat alot of whole grain foods, drink plenty of water, eat fresh vegetables, fruit and get a good nights sleep. one way i stay healthy is to just NOT buy cookies and chips and stuff...i have found if it is NOT in my house it canNOT go into my belly. i still WANT a cookie or little debbie, just can't have it. i think it makes the treats i do get, like an ice cream or something every now and then, even better. I am so jealous! One of these days I think my son WILL turn into yogurt! All of the time it's "Yogo". (He's 21 months so the full word has yet to come out.) He is almost borderline obsessed with it I think! But I couldn't be happier that it's yogurt and not like Snickers or something! I am popping in to welcome you to the SITSahood! Hope you enjoy it as much as I do and we are glad to have you! I try reduce the amount of junk I eat while at the same time eating more GOOD foods. I also try to exercise and with the warm weather coming it will be easier to do that! I emphasize eating fresh fruits and vegetables and yogurt and filling up on those instead of eating less healthy choices. I exercise 4 days/week and drink lots of water. Park further away from stores, and walk a bit further. I also do leg lifts while brushing my teeth. Oh, and dance along to the imagination movers when your kids do! Hubby and I go running together, we both need to chuck about twenty pounds or so to be healthy. I try to eat lots of fruit and veggies as well. I've been cooking a lot of dried beans and lentils which is not only healthy but has the added bonus of being cheap! We eat a least 2 meatless meals a week also and drink a lot of water. The healthiest things are: getting plenty of rest, drinking plenty of water, and staying as active as possible. I now follow your blog as well. Smaller portions and daily exercise! my best tip is to never buy junk food. always bake your own if you want it. I guess my tip would to just stay aware of whats around you and think before you eat. Drink lots of water, limit sweets, and eats lots of fresh foods, especially fruits & veggies! Healthy diet and of course exercise. I also try to buy more organic foods. Come over and enter my Partylite Candles giveaway! I keep fresh fruit around as much as possible - the basics that everyone in the house likes: apples, oranges, and bananas. I also keep baby carrots and radishes in the produce drawer so if I don't feel like making a salad, we can all still have a veggie with dinner. I try and go organic whenever possible, but for some of these items I figure it is more about "balance", and that ultimately it will be a better food choice than a packaged snack or no veggie with dinner. I watch my calories and eat tons of fresh fruits and veggies. This has made a huge difference in my healthy and truly how I feel on a daily basis. Thanks for the entry! I try to keep away from processed foods and always have fresh fruit, veggies, and low fat and non fat dairy snacks available and ready to eat! Also I am commited to cooking at home more, I know exactly what is going into our food and no hidden, unknown fats while eating out! I always try to eat as much whole grains as possible - and we are also avoiding HFCS as my daughter seems to be intolerant.